» What? Yes, our cooling climate! When your bike route is blocked, your thoughts naturally turn to climate issues, right? 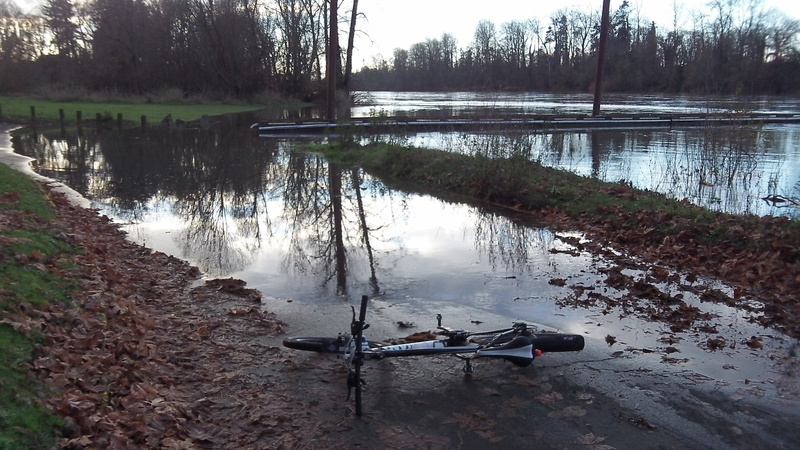 The lower road at Albany’s Bowman Park was under water Saturday because the Willamette River rose quickly over the last couple of days. After cresting on Sunday afternoon at a predicted high of 14.5 feet on the Albany gauge, it will drop again just as quickly as colder weather sets in, possibly along with freezing rain late Sunday night. So it’s obviously time to think, once again, of climate and weather and what they’re doing to those of us not smart enough to move to a tropical isle. This being late November, there’s nothing unusual about either the weather or the river’s rise and fall. But conditions in November and December do make some of us wish that climate change — as in the warming we hear so much about — would make up its mind and arrive a little quicker. It probably won’t, though. Maybe we should worry about cooling instead. Average annual temperatures in the Willamette Valley, as tracked by the National Oceanic and Atmospheric Administration, hover around 52 degrees Fahrenheit and have been trending slightly downward for the last couple of decades. Average valley temperatures in December are about 39 degrees and show a similar downward trend since 1990. For January, the average valley temp is 40 degrees. And the trend line since 1990 is down ever so slightly, a mere 0.1 degrees F per decade, according to NOAA. Yes, those numbers are cherry-picked. If you take much longer periods — and on NOAA’s climate site you can — you see trend lines going up. But what’s been happening lately counts more because it affects what we might expect. 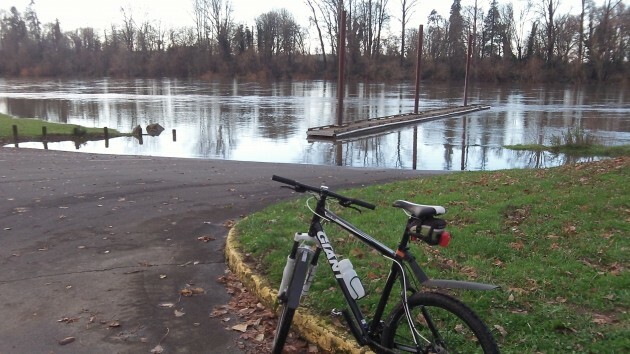 You couldn’t reach the floating dock at Bowman Park with dry feet Saturday. Not sure a tropical island would be the place to go to Mr Hering. With increased ice melts at our polar ends your island paradise might just be awash in a few life times! At Albany’s 200+ feet above sea level I think I’m good for my life time. Keep in mind mother knows best & we still haven’t got a good handle on how the ‘ole girl is making adjustments for her “newest” tenants…that be us Homo sapiens! It was “Global Warming”, until it started getting obvious that wouldn’t fly. They still don’t seem to be able to answer a simple question however. When HAVEN’T we had “Climate Change”? Looking out your window, or pedaling around the area, is not science. 2014 is on track to be the worlds warmest year on record, eclipsing 2010. We’ll know fairly soon if it breaks the 2010 record. It will probably not be the warmest if you just look at the United States, but the world is a lot bigger place. When cold air sinks from the artic over the US, we get colder than other places. At the same time, warm air can move farther north in other places as the cold pool moves. All in all, ocean temperatures may be the most critical component because it covers 2/3 of the planet, and holds a lot of the energy. You have to look at the entire system. Not just what you see at Bowman Park. “…………..but the world is a lot bigger place.” Really? I’m glad someone that posts here is smart. Again I say there are hundreds of experts giving the mantra of Climate Change because the governing class pays their way with funding. Just like obamacare. I remember the day when Bayer Co. would publish a report on the benefits of aspirin and everyone would say “but the study was paid for by Bayer so we should be skeptical”. Thanks Hasso for your skeptical eye.